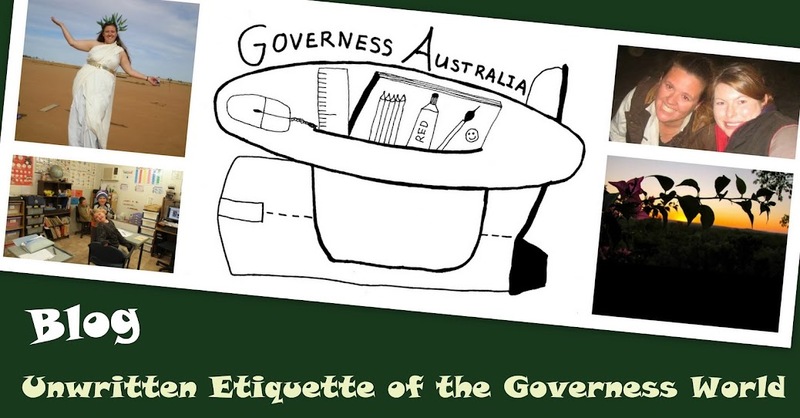 Unwritten Etiquette of the Governess World: Etiquette: I’m not Tina Sparkle, so don’t panic. DON"T PANIC, I am just taking some time out to recharge the batteries. Have some ME time. Living and working at you employment means you are on display constantly. Then you go out on the weekend and smile all the time. If your governess goes out for over half the weekends in the term she is going to need some weekends at home by herself and maybe even with the curtains down. Of course if she spends every weekend at home, then panic. Or invite her out on water run, over for drinks and some fun. PS Tina Sparkle is the character in Strictly Ballroom who smiles and performs all the time.